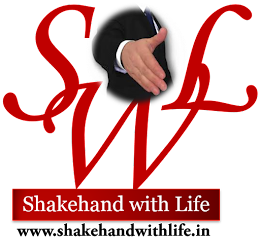 Shakehand with Life: 5S : Best Management Practices from Kitchen to workplace. 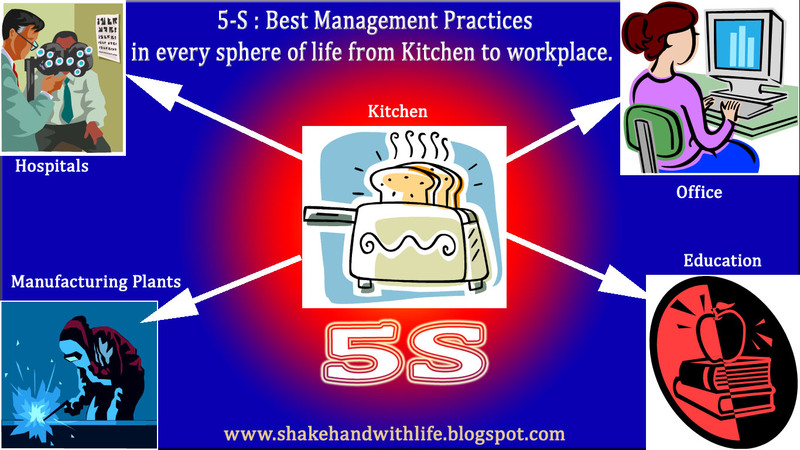 5S : Best Management Practices from Kitchen to workplace. 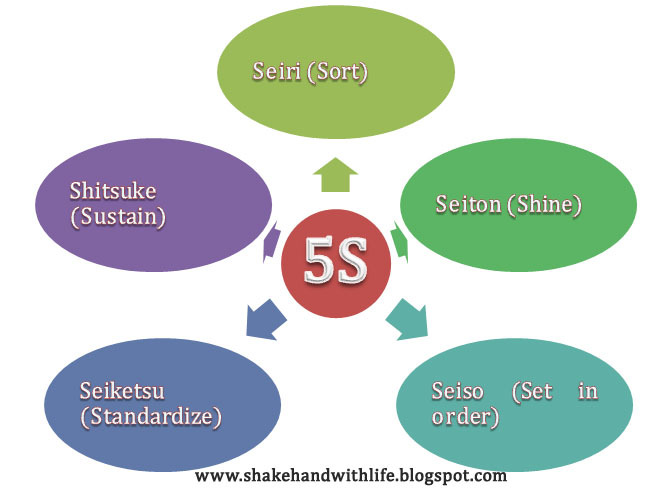 The 5-S technique has been widely practiced in Japan. 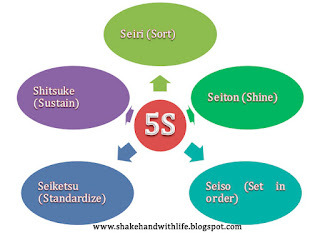 Most Japanese 5-S practitioners consider 5S useful not just for improving their physical environment , but also for improving their thinking processes too. Apparently the 5S can help in all stratas of life from kitchen of lady to the office of a Manager/ CEO of an industry. A lady who handle the kitchen daily practice the 5S even without knowing about it. Organization is about separating the things which are necessary for the job from those that are not and keeping the number of the necessary once as low as possible and at a convenient location. The art of organization is in stratification management. It involves deciding how important something is and then reducing the non essential inventory. At the same time stratification management ensures that the essential things are close at hand for maximum efficiency. Thus the key to good stratification management is the ability to make these decisions about usage frequency and to ensure that things are in their proper places. It is just as important to have the things you do not need far from hand as it is to have the things you do close at hand. It is just as important to be able to throw out a broken or defective part as it is to be able to fix it. A summary of organizing things is shown in table below. Many people do confuse between need and want. Most of us have a colleague who has collected 60 trade magazines in his shelf over the last five years and claims that he wants to keep all of them for reference. If you ask him “Which of the 60 magazines do you need ?”, he would probably scratch his head and say “ I do not know what you are talking about .” However , if you formulate you question the following way: “Which of these 60 magazines have you not been touching over the last year?”, you should not be surprised to find that the answer is 50. Most people tend to err in the beginning , on the conservative side of saving things ‘just in case’. But it is crucial that management make a decision. Is it needed? If not, get rid of it. If yes, how much of it is needed? Get rid of the rest. If something is borrowed , return it to its owner. Start by analyzing how people get things out and put them away, and why it takes so long. This is especially important in workplaces where a lot of different tools and materials are used, because time spent getting things out and putting them away is time lost. For example , If a person gets something out or puts something out or puts something away 200 times a day and each time takes 30 seconds , you are talking about 100 minutes a day. If the average time could be reduced to 10 seconds , more than an hour could be saved. 2. Not sure where things are kept. 3. Storage site far away. 4. Storage site scattered all around. 6. Hard to find because many things are there. 8. Not there, but not clear whether it is finished or somebody is using it. 10. One brought was defective. 11. Hard to get out. 12. Too big to carry. 13. Need to set or assemble. 14. Too heavy to carry. 15. No gangway to transport. Step 2. Decide where things belong. The second step is to decide where things belong. It often happens that an object can have two names: Its real name and what everybody call it. In such cases , make a decision which one you are going to use and stick to it. It only confuses people to have two names for the same object. On the other hand, during stock-take , you may find out that there are many things that do not have a name. There may be times when two different things have the same name, even when there are minor differences between them. You should rectify all these problems as soon as possible. Step 3. Decide how things should be put away. The third step is to decide how things should be put away. This is critical to functional storage. For example, files and tools should be put away so that they are easy to find and easy to access. Storage has to be done with retrieval in mind. Having a name for everything is not yet sufficient. Things must have a location, just like everybody would have a home. It is in fact quite amazing to send a letter through the world-wide mailing system. As long as you put on the right address, it will go to its destination, anywhere in the world. The principle is very simple – there is a name on your letter and then there is a name on the location which matches with that on the letter. Therefore in doing your ‘neatness’ , it is imperative that every object should have both a name an a location. 1. Everything should have a name. · No more homeless items. · Even if someone is just using something temporarily, it should be clear where it is. · Knee to shoulder height most convenient. Step 4. Obey the put –away rules. · Have an indication of who is using it and when they will return it. ‘Everyone is a Janitor’—Cleaning should be done by everyone in the organization, from the managing director to the cleaner. This is why in Japan, they do not need street cleaners in residential areas. Every family is responsible for cleaning the pavement in front of their houses. Therefore, what they need are rubbish collectors. The Japanese believe that while they are doing cleaning, they are cleaning their minds, too. If you have done your annual cleaning at home before the New Year, you would probably have this feeling of freshness. · I will not get things dirty. · I will not spill. · I will not scatter things around. · I will clean things right away. · I will rewrite things that have got erased. · I will tape up things that have come down. 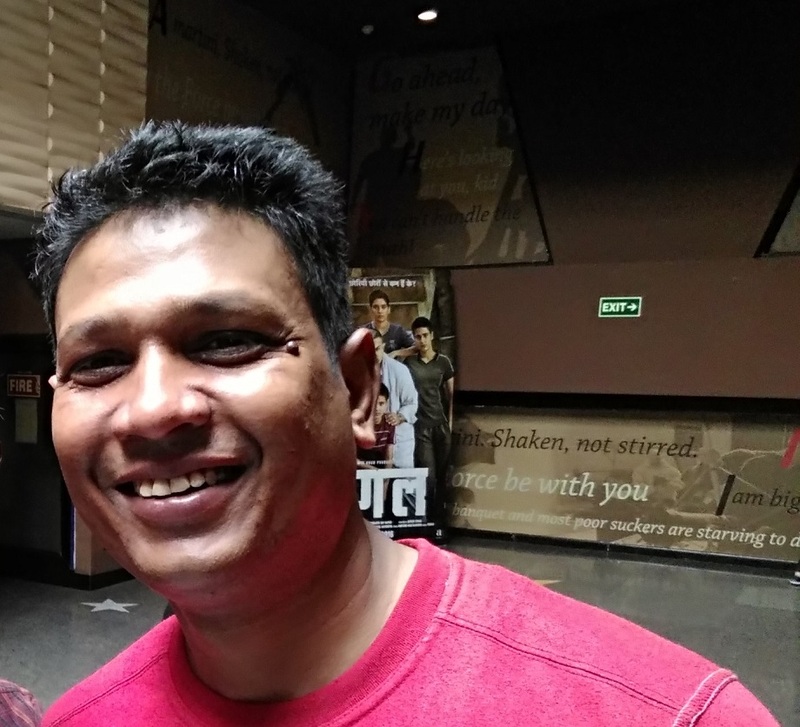 · Dirty air – conditioning filters lead to defects in printing. · Filing in the conveyance chutes lead to scratching. · Scraps in the die leading to faulty pressings. 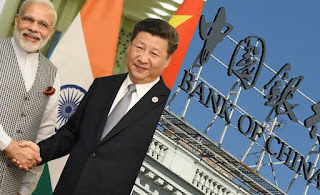 · Things fall off the equipment and get into the products. · Things get dented or bent in conveyance. · Filings and other particles contaminate the resin. · Dirty coolant leads to clogging. · Dust and other substances ruin the painting process. · Bad connections ate made because the electrical contacts are dirty. · Fires are caused because garbage short-circuited the electrical equipment. · Computer always plays up because dirt is accumulated inside. In an office or a factory, you might start by graphing out the individual areas of responsibility. In doing this, it is important that all assignments be absolutely clear and that there is no undefined, unallocated, or grey areas. Unless each and every person takes these admonitions to heart and accepts personal responsibility, you are not going to get anywhere. Standardization means continually and repeatedly maintaining your organization, neatness and cleaning. As such, it embraces both personal cleanliness and the cleanliness of the environment. The emphasis here is on visual management and 5-S standardization. Innovation and total visual management are used to attain and maintain standardized conditions so that you can always act quickly. Visual management has recently come into the limelight as and effective means of continuous improvement. It has been used for production, quality, safety, and customer services. Colour management has also come in for considerable attention lately. This has been used not only for colour-coding, but also to create a more pleasant work environment. There are more and more workers opting for white and other light-coloured clothes. Because these clothes show the dirt quickly, they provide a good indicator of how clean the workplace is. They highlight the need for cleaning. One effective method of visual management is to put up appropriate labels. · Lubrication oil label- Indicate the type, grade, colour, and where it is for. · Annual inspection label-Should be attached to all equipment. · Temperature label –Indicate abnormality or overheat. · Responsibility label-Show who is responsible for what. · Identification label – Tell people what things are. · Safety label – Remind people of special safety considerations. · Zone label on meters – Normal zone and danger zone should be differentiated by different colours. · Ok mark- After things have been inspected, an OK mark will tell others that the part is acceptable. · Position mark- Put little position marks for where things go. Place footprints where people should stand. Place lines to indicate where things are supposed to stop. Put up lots of visual clues so that everybody will be able to see what is happening and to anticipate what will happen next. Another important consideration for standardization is ‘transparency’. In most factories and offices, tools and files are put in lockers, on closed shelves, and under covers to be off sight. Just like sweeping things under the carpet this is known as “out of sight, out of mind” practice. Those closed spaces are often among the most disorderly places, because they are not a constant eyesore. So it will be a good idea to take the wraps off these messes. Make the covers transparent. If you must have metal panels, put inspection windows in them. Make it so that everybody can see what is stored and how good (or bad ) things look. Many places have little ribbons on the fans so you can see the breeze. Sometimes, this method is called ‘visualizing conditions’. As a variation of this, some plant maintenance people put windows and plastic strips in some of the drain pipes so that other people can see the effluent flowing. There are many other things you can do to help people visualize a process. When there are problems, you can show them on a map of the workplace. Just as many sales departments have pins in maps to show where their people are, you can also have pins to show problems, emergency exits, fire-fighting equipment, and other locations. Put the maps where they are visible to everyone. A trouble map can also be used to indicate those workplaces and processes that are trouble-free. By constantly measuring things, quantifying the results, and analyzing the data statistically, you can quickly identify the limits to management and spot deviations before they become major headaches. Discipline means instilling the ability of doing things the way they are supposed to be done. The emphasis here is on creating a workplace with good habits. By teaching everyone what needs to be done and having everyone practicing it bad habits are broken and good ones are formed. This process helps people form habits of making and following the rules. The word shitsuke originally comes from the guiding stitches that are done before a garment is properly sewn. If accepted that way, discipline is an underlying tool in making life go smoother. It is recognized by the Japanese as the minimum the society needs in order to function properly. Self –discipline is important because it reaches beyond discipline. If a person is ‘disciplined’ to do something at one time there is a chance that he may not be disciplined next time. However, self-discipline guarantees the continuity of a daily routine. The Japanese are a very self-disciplined race: they have one of the lowet crime rates in the world and are well-known as ‘obedient’ tourists. Discipline is process of repetition and practice. Think of discipline as an integral part of industrial safety helmet, their safety shoes, or their goggles? Far too many. How many have had accidents because they stuck their hands into the machinery without shutting it off first? Again, too many. It is important that everyone has the habit of obeying simple safety rules. Check for any leakage or dropping, and pick up any parts, work, trash, or whatever that is on the floor. Wipe the meters, position markings, main places on the machinery and other important places with a rag. Wipe up any water, oil, or whatever that may have spilled or leaked. Realign anything that is out of place. Clean up the plates and labels and make sure they are clearly legible. Make sure all of the bits and tools are where they should be. Get rid of anything that is not needed there. Wipe the key parts and other places on the machinery with a rag. Fix any labels that might be coming off. Get rid of the trash in the trash bins. Check the labels, instructions and oil inlets, and fix anything that is amiss. Tidy up and clean your desktop. Check your documents and files are and put them back to their ‘home’. Get rid of things you do not need, including personal effects in your desk drawers. Check where the filing cabinets, bookcases, and other furniture are and fix them if they are out of place. Get rid of anything that you do not need that is on top of filing cabinets, bookcases, and other furniture. Clean the floor and your surrounding area. Check to see that the files are numbered, in proper order, and all accounted for. Check to see how many pencils, ball pens, erasers, and other things you have. Reduce them to ‘one-is best’. Excellent Narender!!! Would like to learn more. I аbsоlutely lovе thiѕ websіte. Nice post. Such a nice post.